A valuable and comprehensive safety reference for any organization working with or around electricity. This comprehensive guide informs working professionals in multiple industries, such as manufacturing, processing, or energy, about safety procedures that should be used on the job. It informs the reader about the hazards in the work place and what to do to make sure he/she is protected. 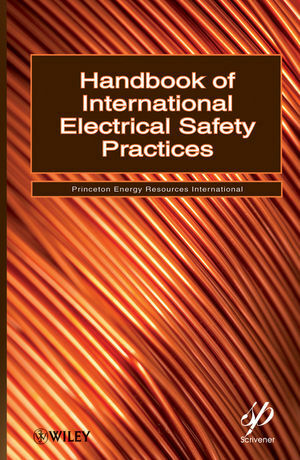 The Handbook of International Electrical Safety Practices presents readers with the proper organizational skills needed to avoid hazardous injuries, details environmental monitoring techniques, and discusses how to ensure that proper protection is used on the job. The authors cover not only obvious electrical safety considerations, such as exposed wires and evacuation plans, but everything related to electrical safety, such as air quality, sound level, and radiation. This reference provides the most comprehensive coverage for any company to keep employees informed and to keep their work environment safe. Princeton Energy Resources International, LLC (PERI) is an energy and environmental consulting firm providing engineering, technical, economic, policy, and regulatory services to various government agencies, bilateral and multilateral financial institutions, and private sector clients worldwide. In addition to traditional project services such as feasibility studies, planning, policy design, environmental review and assessments, engineering design, and construction management/ inspection services, PERI provides technical assistance to governments, their agencies, and private sector organizations to strengthen institutional capabilities through organizational development, sector reform, technology transfer, and training. Headquartered in Rockville, Maryland, just outside of Washington, DC, PERI is within easy reach of U.S. Federal Government Agencies and national, bilateral and multilateral financial institutions such as the Export-Import Bank of the United States, the Overseas Private Investment Corporation (OPIC), the World Bank, the International Finance Corporation (IFC), and the Inter-American Development Bank. Chapter 1 How to Evaluate Safety Programs. 1.2 Creating a Culture of Safety. Chapter 2 Meters and Monitors. 2.1 Air Quality Testing and Monitoring. 2.2 Noise Testing and Monitoring. 2.3 Radiation Monitors and Meters. Chapter 3 General Safety Practices. 3.2 Job Hazards Analysis Assessment. 3.4 First Aid and Resuscitation. 3.5 Fire Protection, Evacuation, First Responder and Emergency Planning. Chapter 4 Safe Use of Equipment. 4.1 Hand Tools and Workshop Machines. 4.5 Scaffolds and Other Work Platforms. 4.6 Compressed Gas Cylinder Safety. 5.1 Electric Shock and Lockout/Tagout. 5.2 Linemen General Safety Practices. 5.3 Electrical Safe Work Practices Plan. 5.5 Safe Work Practices Near Power Lines. 5.6 Functional Safety for Electric Power Transmission. Chapter 6 Worker Safety Rules. 6.5 Hazard Assessment and Personal Protective Equipment Selection. 6.7 Safety Color Code for Marking Physical Hazards. 6.8 Specifications for Accident Prevention Signs and Tags. 6.9 Permits for Confined Spaces. 6.10 Control of Hazardous Energy (Lockout/Tagout). 6.11 Medical Services and First Aid. Chapter 7 Recordkeeping, Training and Inspections, Accident Investigation and Reporting. 7.2 Safety Recordkeeping Practices and Protocols. 7.3 Safety Training and Recordkeeping. 7.4 OHSAS 18001 (Occupation Health and Safety Assessment Series). Chapter 8 Risk and Vulnerability Assessments. Appendix A Chemical Exposure Tables.